There was an excellent program Saturday morning on The People’s Pharmacy about the healing power of pets. Siglinda was so inspired, she sent them the email below. Be sure to check out their web site! Thank you so much for this morning’s program. 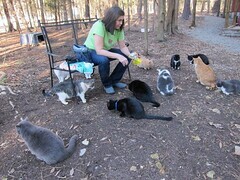 I am the founder of the largest no-kill shelter in NC: The Goathouse Refuge. We receive, every day, phone calls from people who want to “get rid” of their cats for various reasons, the most common is allergies. Real or not, we have the Refuge full of cats that have been abandoned by their families. Many of those poor creatures are desperate for months, refusing to eat, hiding under blankets, crying for their families. All we can do is care for them, hold them, and give them all the attention we can. Some need to be forced to eat for a long time. Your program and the book of Dr. Marty Becker are important tools to help people to understand animals and the value of the relationship with them. When my daughter was 1 month old, I found a few weeks old kitten in a park in Rome, Italy, he slept with her and grew up with her. Whenever she would cry, he would jump next to her and comfort her and she would stop crying. He became a very big tabby cat and was her inseparable beloved companion. Never she became sick because of the cat, actually, I know, she was healthier because of the emotional support he always gave her and because she grew a strong immune system by being in a clean but not sterilized environment. I personally learned to be patient, to listen, to pay attention and to love from all the wonderful animals in my whole life. I am going to put a link to your program on our website.